Modulation in the photophysical properties of 4',6-diamidino-2-phenylindole (DAPI) on its interaction with ß-cyclodextrin (ßCD) and γ-cyclodextrin (γCD) hosts has been investigated using ground-state absorption and steady-state and time-resolved fluorescence measurements. In aqueous solution, the planer (benzene and indole moieties are on the same plane) and the twisted (benzene and indole moieties are perpendicular to each other) conformers of DAPI are in equilibrium. Both the conformers undergo inclusion complex formation independently with ßCD and γCD hosts. Effective binding constant (Keq) values for DAPI with ßCD and γCD hosts are estimated as ~130 M-1 and ~30 M-1, respectively. As these Keq values are only at the lower range, the inclusion complexes in these systems are suggested to be due to weak hydrophobic interactions. Significantly lower Keq value for DAPI•γCD system is attributed to loose binding of DAPI to large γCD cavity. Results from time-resolved fluorescence studies clearly indicate the formation of both 1:1 (DAPI•CD) and 2:1 (DAPI2•CD) complexes in the present systems, where 2:1 complexes contribute significantly mainly at the lower range of host concentration. Based on the relative dimensions of DAPI and host cavities, and considering that the higher Van der Waals contacts give better hydrophobic interaction for the complex, it is suggested that the inclusion complexes in the present systems are formed with the indole moiety of DAPI entering the host cavity. 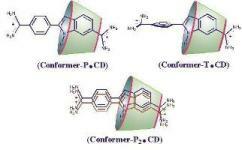 In the 2:1 complexes, the p-p interaction between the chromophoric moieties of the two co-occupied dye molecules brings about an additional stabilization to overcome the ion-ion repulsion between the two cationic guests. Changes in the photophysical properties of DAPI in the presence of ßCD and γCD hosts suggest that the inclusion complex formation in the present systems largely retards the solvent (water) mediated excited state protonation process for the dye and accordingly enhances its fluorescence intensity and lifetime very significantly.